The Tasmanian Blue Gum tree is part of a larger group of evergreen trees native to Tasmania and Australia collectively called Eucalyptus that can grow up to 400 feet tall in their native habitat. The Tasmanian Blue Gum grows rapidly, up to 80 feet in its first 20 years, and can reach heights of up to 160 feet in its introduced habitat in California, actively growing in the all but the summer season. Of the species of eucalyptus introduced worldwide, it is the one most commonly encountered. The tree can grow in a variety of soil types in communities with mild weather and a high moisture content. It cannot tolerate cold, frost, drought, or harsh winds, requiring at least 240 frost free days, and temperatures above 17°F. The Blue Gum tree, as it is sometimes known as, is called such due to a sticky gum-like substance that the tree secretes. This gum is very fragrant and contains anti-bacterial properties which make the tree extremely pest-resistant, as well as acting as a deterrent to the growth of other non-eucalyptus plants. The smooth, brown outer bark of the Blue Gum peels in large pieces to reveal large patches of bluish-white bark underneath, giving the tree a piebald appearance. The gray-green leaves grow in thick, smooth, and rounded and gradually stretch out to a sharp elliptic-shape. The yellow flowers produced by the Blue Gum in the fall lack petals and so assume a feathery starburst pattern with the multitude of stamens arising from the calyx. The multitude of black seeds produced winter to fall have a propagation rate and a moderate wind dispersal distance of up to 20 meters. The trees prefer to grow in dense stands, from as little as 170 trees per acre up to 1200. The Blue Gum tree does not propagate vegetatively on its own, but can be transplanted from the bare roots through human intervention. The Tasmanian Blue Gum is native to Tasmania, as the name suggests, and Australia. It is restricted to the southeast coast and small areas of the west coast of Tasmania, the islands to the north of Tasmania in the Bass Straight, and to southern Victoria in Cape Otaway and Wilson’s Promontory in Australia. The Tasmanian Blue Gum is currently invasive in the United States in California and Hawaii. It has invaded riparian habitats, grasslands, any habitat with a high soil moisture content and a moderate climate. In California, it is located along the costal ranges, from the north in Humboldt County all the way down the state to San Diego County, growing the most successfully in the foggy coast surrounding the San Francisco Bay Area. In Hawaii, the 12,000 acres are mostly located on Hawaii and Maui. The Blue Gum has been successful introduced in the hills of first northern and then southern, surviving at altitudes up 2200 m where there is adequate rainfall. There are vast plantation located in Southeast Asia, Southern Europe, and Brazil for commercial purposes. It is also growing successfully in the areas of Ethiopia and Argentina which have summer rainfall. Almost 15% of Portugal’s land area is covered in the Blue Gum tree. Eucalyptus globulus was introduced into India beginning in the late 1700s. Its import into Brazil is hazy, with some reporting the first introduction of the eucalyptus into the Botanical Garden of Rio de Janeiro by the director of the garden in 1824. But the first known introduction of the E. globulus was by Edmundo Navarro de Andrade, an agronomist who planted the first seeds in São Paulo in 1904. 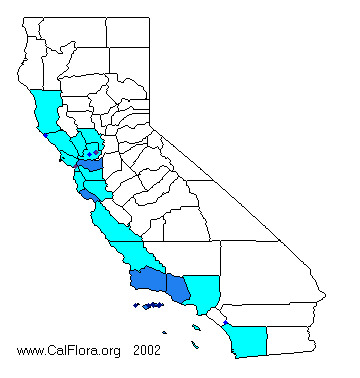 The Blue Gum was brought to California in 1856 and Hawaii in 1865. It was also introduced and is still found in Arizona as an ornamental species, but has not become naturalized due to the dry climate. People deliberately imported the Tasmanian Blue Gum tree for economic and ornamental purposes. Since then, it has found a favorable habitat and has aggressively spread into the natural habitat, forcing out other forms of vegetation by inhibiting the growth and germination of other plants. One of the main reasons the Tasmanian Blue Gum tree has become established is because of its great economic importance. It grows rapidly and can be used for a large variety of timber products, and so was deliberately aggressively imported into areas that were comparable to its original environment. It did not have to adapt to vastly different surroundings to become established. Its rapid growth rate, dense stands, and ability to suppress outside vegetation made it easy for even one tree to rapidly clear the surrounding area and prepare the area for other eucalyptus. Its saplings have a very high rate of survival due to the fact that it is very rarely eaten by large herbivores. Its ability to survive a large range of terrain types, from coarse to fine soil, sea level up to around 1000 feet in altitude, means that the only limiting factors in range are temperature and water content. In California, the tree is able to withstand the long dry periods because of the frequent fog. The Tasmanian Blue Gum is rich in nectar and so are a good crop for bees and hummingbirds. They inhibit the growth of other vegetation and so create virtual monocultures of various eucalyptus trees, with the exception of a few hardy grasses. They provide habitats for insects and birds which do not interact with the tree itself other than as a support. There are a vast number of economic uses for Gum trees. Due to their rapid growth rate, from 5 to 10 years for a rotation depending on the location, they have been used in a number of timber products, including wood pulp, and fuel wood for engines and human consumption, charcoal production for charcoal-based iron and steel. They have even been pre-planted along railroad routes to be harvested for the wooden slats as the assembly progresses. They can be used to rapidly reforest a decimated area, planted to control soil erosion, and are easily regrown for any commercial use. E. globulus is also very valuable as a windbreaker. It has been used as a hedge species along highways for sight and sound barriers, and as a natural fence for grazing fields. The loss of biodiversity and habitat is a great threat from the Tasmanian Blue Gum tree, as it is from any eucalyptus. It creates virtual monocultures and can rapidly take over surrounding compatible areas, completely changing the ecosystem. That monoculture creates a loss of habitats for many species that relied on the previous system. Due to its great capacity for taking over a wide variety of habitats, the Blue Gum eucalyptus could possibly spread to a great range of systems where there is enough water content and create huge monocultures. Minimal Priority - Though the Tasmanian Blue Gum has the potential to quickly overtake and completely change a new habitat, it has a strict set of requirements for moisture and temperature. Though the E. globulus has been classified as a List A-1 invader in California by CalEPPC, an aggressive invader that is a pest in more than three Jepson regions, I believe that the Blue gum tree has already invaded as far as it is going to and so has little aptitude for further growth without major changes to the global ecosystems and therefore is not currently a major threat. The most successful control method is to make grooves in the tree bases and flood them with a 3lb/gal solution of glyphosphate in water, killing the tree permanently. Fire and drought can be a useful tool against the Blue Gum eucalyptus, as it is extremely vulnerable to fire during the dry season, when the bark is dryer and the oil in the leaves more volatile. This control method would not work however in areas where there is a high moisture content year round, and is not completely successful since the trees can sprout from the burnt stems and bases. Drought is not completely successful either and is hard to control. Frost can be used as a control method as well, but the trees gain resistance as they mature, so this would only be a successful method in seedlings, along with simply trampling or girding. There are several possibilities for control with natural predators of the Tasmanian Blue Gum. The presence of the native insect herbivore, the eucalyptus psyllid (Ctenarytaina eucalypti) has been shown to decrease the growth rate of the Tasmanian Blue Gum along with the other varieties of eucalyptus trees. It showed up in greater quantities around eucalyptus plantations in the 1970s. Though following this introduction, the search and introduction of a biocontrol agent for the psyllid was implemented in Monterey County, California, the psyllid can be used in the future as a possible control agent for the E. globulus. Some other insects that attacks the Blue Gum and can cause severe damage and mortality are the wood borer (Phoracantha semipunctata) and a scale insect (Eriococcus coriaceus). There are several fungi that attack this eucalyptus, but none have a very large effect except on stored seeds. Overall, the biocontrol angle does not look to be a promising angle for control. Hodkinson, Ian D. 1999. Biocontrol of eucalyptus psyllid Ctenarytaina eucalypti by the Australian parasitoid Psyllaephagus pilosus: a review of current programmes and their success. Biocontrol News and Information 20(4): 129N-134N. Kandasamy, O.S., Yassin M. Mohamed, R.C. Babu. 2002. Biology, ecology, silviculture and potential uses of Eucalyptus: An overview (abstract). Journal of Medicinal & Aromatic Plant Sciences. 22(1B): 330-335. Souto, X.C., J.C. Bolano, L. Gonzalez, M.J. Reigosa. 2001. Allelopathic effects of tree species on some soil microbial population and herbaceous plants (abstract). Biologica Planatarum (Prague). 44(2): 269-275.